Calling all chocoholics and chocolate lovers – this is the ultimate chocolate cake! 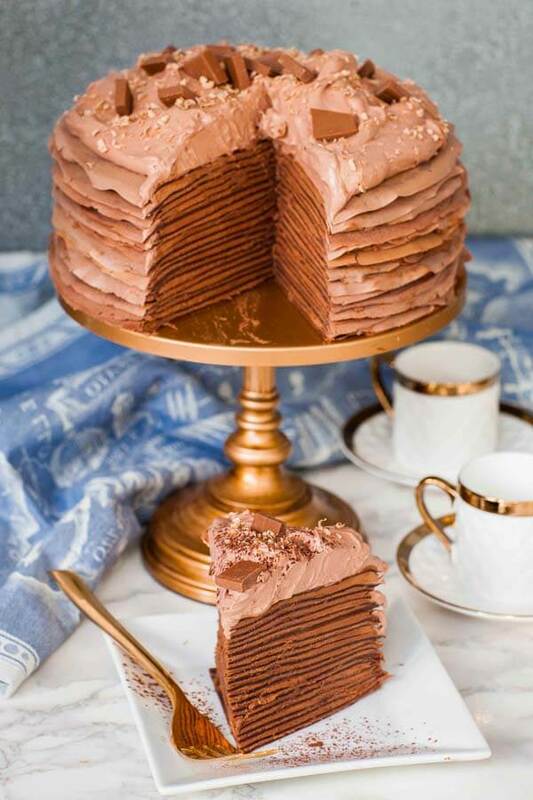 My triple chocolate crepe cake recipe is made with decadent chocolate crepes, a two-ingredient chocolate truffle filling and topped with fluffy chocolate whipped cream. 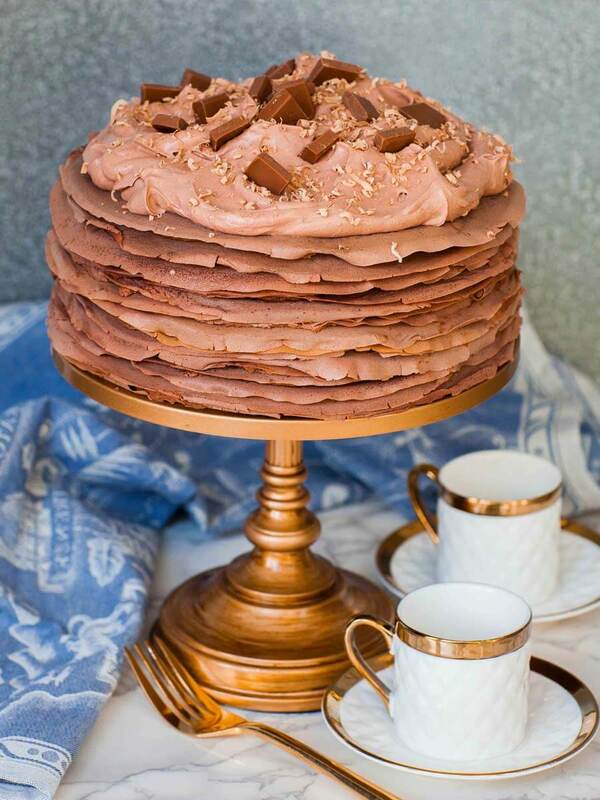 This stunning cake has a total of 40 delicate layers of crepes and truffle filling! It’s not too sweet or overwhelming and is perfect after dinner with sweet dessert wine. This is one crepe cake you must try! Watch my video for step-by-step instructions! Want to receive new recipe updates? Make sure to subscribe to my YouTube channel and turn on notifications! 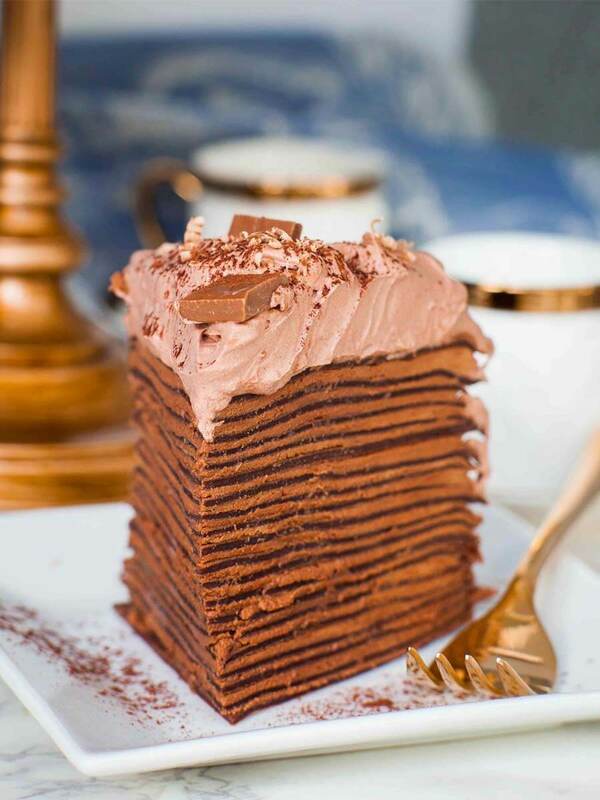 As implied by the title, this chocolate cake is made with crepes instead of cake layers! Making crepes is just a little time consuming but it’s time well-spent! These chocolate crepes are made with special dark cocoa powder from Hershey’s. It’s a brand that I’ve used for a long time and I love the rich chocolate flavor. Here are a few of my tips for making perfect crepes every time! If you have the time, allow the refrigerated ingredients to warm up to room temperature. Cold milk can cause clumps of butter to form. Use a blender to make the batter! This is the easiest way to make the smoothest crepe batter! Just place all the ingredients into a tall blender container and pulse for a few minutes. Let the batter stand for a few minutes before using. Make sure your crepe pan is nice and hot! A hot pan will cook the crepes quickly and will be non-stick. A cold pan can cause the crepes to stick and cook very slowly. This crepe recipe makes 20 to 22 crepes when used with an 8-inch crepe pan. These crepes are great for breakfast, too! Tr them with nutella and strawberries. I went with the most amazing chocolate filling to go with the chocolate crepes. This easy two-ingredient truffle filling can’t be more perfect! Just heat the chocolate chips and heavy cream until the chocolate is smooth, then refrigerate. Once the ganache is cooled, whisk it using a mixer and a fluffy filling forms! It’s so easy to make and perfect as a filling for this cake and it can be used as a filling for many dessert recipes! You can watch more about chocolate ganache here. Looking for more recipes? 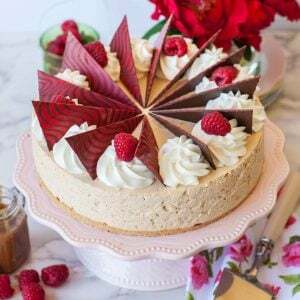 Try my ‘Red Velvet Crepe Cake’ with whipped cream frosting next! I love this ‘Tiramisu Crepe Cake’ recipe with coffee-flavored crepes and whipped cream frosting! I love my Ninja food blender – it’s great for this crepe recipe and for smoothies! Use this handheld KitchenAid mixer for smaller baking jobs that don’t require a large mixer. This non-stick crepe pan is perfect for making crepes any time! Prepare the chocolate truffle filling first. Place the chocolate chips into a large microwave-safe bowl and pour in the cream. Heat the chocolate and cream in the microwave, stirring every minute, until the chocolate is melted and smooth. This can also be done over a double boiler. Cover the resulting ganache and place into the refrigerator to cool completely. This can also be done ahead of time. Next, prepare the crepes. If using a blender, simply place all the ingredients into the blender and pulse for 2 to 3 minutes until a smooth batter forms. Let the batter rest for a few minutes before using. To prepare the batter by hand or with a mixer, first whisk together the eggs, milk, melted butter, vanilla and sugar for 2 to 3 minutes, until smooth. Sift the flour and cocoa powder into the batter and whisk again until smooth. Preheat a crepe pan over medium heat. Add 1/4 cup crepe batter per crepe. Pour the batter into the center of the pan, then tilt the pan around to spread the batter evenly. Cook for about 1 minute on the first side, until the batter is no longer 'wet' and 'shiny' on the top. Use a rubber spatula to turn the crepe over and cook on the other side for 30 seconds. Stack the crepes onto a wire rack to cool completely. Don't stack the crepes directly one atop the other - stagger them to cool faster. Assemble the cake once the crepes are completely cooled. Once the chocolate ganache is completely cooled, whisk it using a mixer on high speed for 2 to 4 minutes, until a fluffy filling forms. The filling should be fluffy but be take care not to over-mix the ganache which can cause it to separate. Because the ganache is cold, it will be on the thicker side. Spread 1/4 cup of the chocolate filling between each crepe, spreading it evenly to the edges. The cake can be assembled free form on a cake stand, or you can assemble it in a spring form pan if you want straight and even edges. Once the crepe cake is assembled, place it into the refrigerator for at least 1 hour before serving to allow the layers to set together. This cake can be made ahead of time, just make sure to keep it covered so it doesn't dry out. What size crepe pan do you use? Cannot wait to try this beautiful thing! can you make a rasberry crepe cake please? I am enjoying watching your videos.I gave a recipe to my mom for your creamy chicken mushroom pasta.My mom did not have white wine so she substituted lemon juice it tasted better! Sure! 🙂 And make sure to check out the recipes I already have!